There is a hot debate amongst SEOs about what type of redirects to use for SEO, particularly when it comes to passing PageRank. At Big Digital Adelaide today, I asked Gary Illyes from Google about the great redirect debate, and whether it really matters whether a site uses a 301, 302 or 3o7 redirect, as we have seen sites use a variety of redirect styles, for whatever reason. I recently saw someone trying to argue that the use of a 307 redirect was a blackhat spam technique, while many sites use a 302 when they clearly mean to use a 301. Google has also said it doesn’t matter whether you use a 301 or a 302 when switching to HTTPS, they will both pass PageRank to the new URLs, which makes sense since site owners would be reluctant to switch to HTTPS if there was the potential loss of PageRank from making a site more secure. Of course, the “best practices” option is to use a 301 redirect when it is permanent, but sometimes website owners or the tech department use one of the other redirects. But it won’t cause issues related to loss of PageRank by doing so. 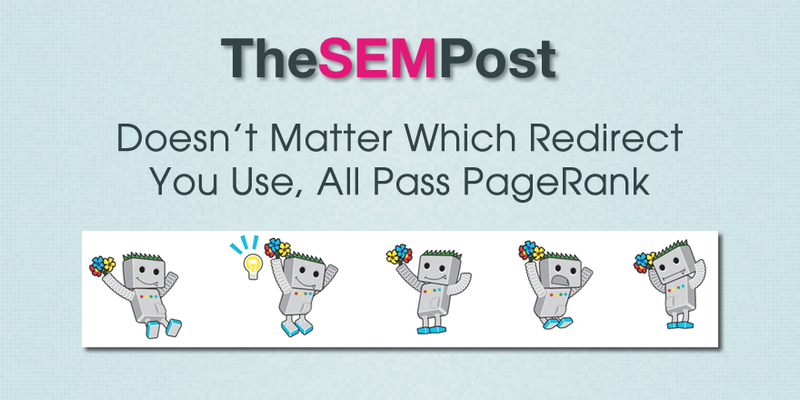 Just my two cents, but it doesn’t seem like Gary confirmed all three types pass page rank equally. From the quote above it sounds more like he’s speaking more philosophically and meaning you should use what makes the most sense to your situation regardless of page rank. Basically meaning take SEO out of the equation when making decisions for your site.